This "Mad World" video is complete with printed words and I thought the following phrase was most appropriate for the post; "When People run in circles, It's a very, very...Mad World...Mad World...Mad World". Jim Stergios' arguments mirror the arguments we have been making against these standards. 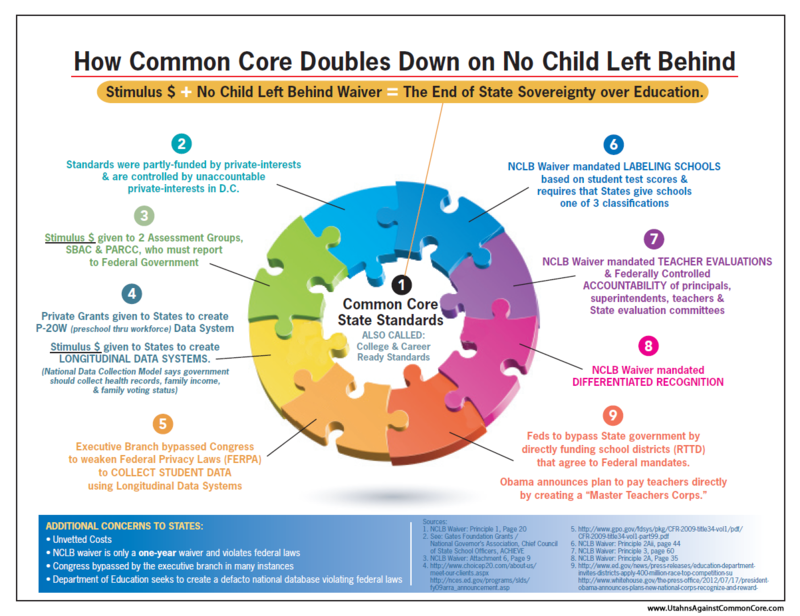 The columnist quotes Tom Birmingham, former Massachusetts Senate president and state education reformer, about the signing on to the common core standards: "Low-reward, high-risk move". Like Massachusetts, Missouri has higher standards than the current national standards. Like Massachusetts, we will have to take the focus off the kids to implement the new standards. Like Massachusetts, we've signed onto standards that have yet to be finalized. This reminds me of signing a blank contract for a business transaction. Would you sign such a piece of paper? Of course not. There are too many "fill in the blanks" that could be filled in at a later time to your detriment. This would be considered "madness", would it not? What the Massachusetts and Missouri state school boards have done is sign our children and teachers to learn/teach unknown standards. These Boards of Education have taken a page out of Nancy Pelosi's guide to government: "we have to sign it to find out what's in it". 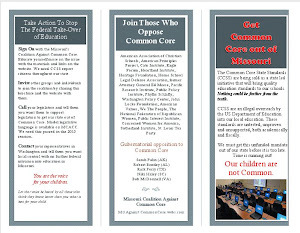 Why did the Massachusetts and Missouri State Boards of Education sign on to common core standards? I propose it's because it's the precursor to be considered for Race to the Top funding. Remember, that's the money the state accepts so taxpayers will sink futher into debt...to the tune of $150 Million in Missouri. This sounds like an unwise proposition to me. But it's all about the kids....right? Tell that to the parents as once again, the Department of Education gurus go chasing after yet more theories for educational reform. These theories will allow our children to become competitive in a "global society". It doesn't matter this will take years to put into place and billions of dollars. 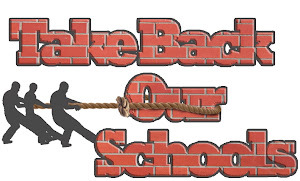 It doesn't matter this creates chaos for teachers and their students. It doesn't matter the Federal Government hasn't created a substantial increase in test scoring in 40 years, even as they have spent millions of our tax money money on this quest. UPDATED: Read this post from Politico. The President is making a personal pitch for this program of control. Congress won't release some of the money for the "reforms" so now states are competing for even a smaller share of funding. Hmm. Instead of being on the hook for $150 Million here in Missouri, maybe we'll have to foot the entire bill of the changes we've been mandated to implement. I swear, even if I had been writing fiction, I couldn't think up this foolishness and madness.